Anjaneyalu obtained a loan from Aye to purchase new machines, which allowed him to grow his business. Mastercard has supported Accion since 2011, primarily through the Mastercard Center for Inclusive Growth, an independent subsidiary founded in 2013. Multiple Accion programs and teams, including the Center for Financial Inclusion, Accion Venture Lab, and Accion in the US, have benefited from the partnership. The Mastercard Center focuses much of its efforts on a subset of entrepreneurs it calls “strivers.” Strivers are entrepreneurs with the motivation and propensity for growth and who with strategic, well-tailored support can grow their businesses into profitable entities and engines for job creation. The Center’s focus on strivers resonates with Accion and together the two organizations have been able to catalyze real impact for this segment of micro and small businesses. Mastercard and Accion have worked together to empower entrepreneurs across the world, through inclusive tech solutions that meet hyperlocal needs. One example is India’s Aye Finance, a startup that lends to small businesses that don’t meet the traditional criteria for business loans. The Mastercard Center for Inclusive Growth helped fund Accion’s advisory service team’s work with Aye to develop digital solutions for its clients. Notably, the team was able to introduce a mobile app that enables small business owners to track business inputs, sales, payables and receivables to help them run more efficiently and allow Aye to offer more relevant targeted products and services. Mastercard continues to be a critical part of Accion’s overall work seeking out exciting new companies to support. In order to help Accion Venture Lab to deepen its support for MSME financing companies that help small and growing businesses around the world to meet their financial needs, Mastercard funding has been used to assist Venture Lab in identifying and investing in promising MSME lender startups, helping its current MSME-oriented portfolio companies to grow and thrive, and amplifying the potential for investor interest in this sector. 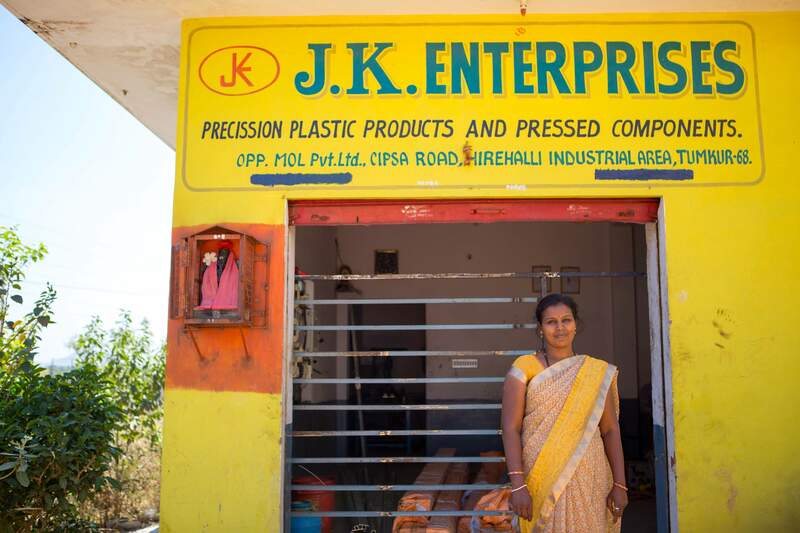 Aye Finance provided client Vanaja enough capital to run the family business while still having time to spend with her children. In November 2018, Mastercard and Accion announced a first-of-its-kind partnership to bring their worldwide networks and resources together to transform millions of underserved micro and small businesses around the world. Through insights, innovations and investments, the organizations will power microbusinesses to successfully operate in, and benefit from, the digital economy, leading to greater financial inclusion, economic growth and job creation. Accion celebrated its partnership with Mastercard in 2016 by honoring President and CEO Ajay Banga at its 55th-anniversary gala. Under Banga’s leadership, in 2015, Mastercard pledged to reach 500 million people previously excluded from financial services by the year 2020. As of the end of 2017, it had reached 330 million through initiatives in over 60 countries, including projects carried out with Accion. The Accion-Mastercard Center for Inclusive Growth relationship continues to be a fruitful one, with frequent engagements between leaders from both organizations to discuss areas of mutual interest and opportunities to collaborate on events, research, and programs.